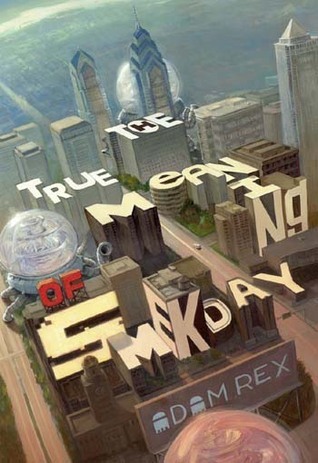 Author and illustrator Adam Rex agreed to stop by to answer a few questions about his novel The True Meaning of Smekday. I recently finished listening to his first novel and never laughed so hard in all my life at the hilarity of the plot and the characters. Fully illustrated with “photos,” drawings, newspaper clippings, and comics sequences, this is a hilarious, perceptive, genre-bending novel by a remarkable new talent. Foodie Bibliophile: I know this is an unusual question and you’ve probably never heard it before but.... wait for it.... what was your inspiration for writing Smekday? Adam Rex: A number of things. I'd been doing a lot of reading about American and world history at the time, and had my eyes opened to a number inaccuracies I'd been fed back in school. I'd always thought that an alien invasion would be a fair way to examine things like Manifest Destiny, and colonialism, and any number of other presumptions we as Americans make or have made in the past. The Rabbits by John Marsden and Shaun Tan was a big influence, too. So much so that The True Meaning of Smekday began life as a picture book. A really crappy picture book. Eventually I realized I was trying to write a novel, and eventually a potentially didactic allegory about imperialism turned into more of a buddy comedy road movie with spaceships. And thank goodness. FB: An alien named J. Lo, a girl named Gratuity... is there a bit of madness involved with a sense of humor like that? Or is it just pure genius? AR: That's quite an either/or. I think I'll choose C) that these names would make a fair amount of sense if you'd been there to watch me connect the dots. With J.Lo, I liked the idea of an alien choosing what he assumes to be a common earth name and getting it all wrong. Maybe he hears a particular name over and over in human broadcasting and fails to recognize that every instance is referring to the same celebrity. J.Lo was originally named Oprah, but then I recalled that this joke had already been done in the first Austin Powers movie–Austin is undercover with Elizabeth Hurley, and he introduces her as Oprah because he, presumably, had been hearing this name a lot since emerging from thirty years of cryogenic suspension and figures it to be nicely inconspicuous. So I was disappointed to discover that I'd hit upon essentially the exact same joke. Then I thought about it a little harder and realized Douglas Adams had done the same thing with his alien Ford Prefect (named for an English automobile), but by this point I was inclined to cling to the joke out of pure stubbornness. Gratuity's mom intended to give her daughter one of those virtuous girl names like Hope, or Grace, or Charity. She thought gratuity meant something like "a state of being grateful," and by the time she realized she was only tangentially right the birth certificate had already been signed. FB: Oprah still would have been hilarious, but I understand your trepidation in using it. The dialogue in Smekday was some of the funniest I’ve ever read in a book and much of that had to do with J.Lo’s cadence and way of speaking English. Was his manner of speaking inspired by any particular person? AR: J.Lo's attitude, and his way of speaking, are kind of an exaggeration of the way I am when I'm at my most comfortable and...playful, for lack of a better word. His speech is reflective of how I might speak around my wife (and no one else). I'm not sure where it came from. Although I should probably admit that I don't really talk like that anymore–now that I've set it in print as J.Lo's way of speaking, I feel awkward doing it myself. It's like I'm doing an impersonation now. FB: I have to hand it to you, as a male author, you could have easily written this book with a male, Caucasian protagonist and the story still would have worked. Instead, you chose to make your protagonist female and bi-racial. What made you decide to do this? AR: It's hard at this point to even remember having made the decision. But I do remember thinking that any middle-grade kid who could deal with losing her mother to aliens; and watching her species be conquered in general; and then pick up and get herself across the country and save the world? She'd have to be in possession of a pretty strong personality. And it probably speaks to my own issues with gender roles and so forth that I thought this headstrong and sometimes bossy and self-aggrandizing personality would be more appealing coming from a girl and possibly off-putting coming from a boy. The question of race wasn't so complicated. I'd recently moved to West Philadelphia when I started writing Smekday, and I was surrounded by black kids. I just started imagining them as little world-savers. FB: Besides the humor, what do you hope kids get out of this book from reading it? It seems like there’s lots of symbolism and life lessons scattered throughout the humor. AR: First and foremost, I hope they grow to love the characters, because I love the characters. Honestly, they could fail to even notice the politics and I'd be thrilled if they love the characters. FB: Well, I'm an adult, but you succeeded in making me love the characters! In looking at your body of work, you’ve illustrated a great many books. Do you consider yourself an artist who happens to write or do you want to be known as a writer and an artist? Or does it matter? AR: I think it's interesting that I get this question a lot. It's like people find both writing novels and illustrating books to be a little unseemly, so they want me to choose. But to choose one would be to essentially diminish the other. It would be like I was trying to manage expectations–"I'm an artist who writes, so naturally don't expect so much from my writing." So I do think it matters, and I'd like to be known as both. Which of your books do you think most defines who you are as a writer and/or artist? AR: Probably a toss-up between Smekday and my picture book Frankenstein Makes a Sandwich. FB: Any plans to write another novel? AR: Well, my second novel (and first for teens and adults) Fat Vampire has been out for about eight months. I'm working on a new middle-grade trilogy now. The first book should be out next year. FB: Well you can be sure that I will be reading it as soon as it comes out. I'm looking forward to reading your second novel Fat Vampire as well! Thank you so much for stopping by Adam! If you're in need of a good laugh, everyone should go out and read (or listen to) The True Meaning of Smekday. What a great interview! So cool to learn how Mr. Rex happened to name the alien J.Lo. I loved that!